We have had Lego trains running on our garden railways before, using a chassis made of wood and metal, and bodywork made out of the famous bricks. SM32 track, commonly used in narrow-gauge garden railways, has a rail gauge of 32mm (the same as O-gauge) and a back-to-back of about 28mm. 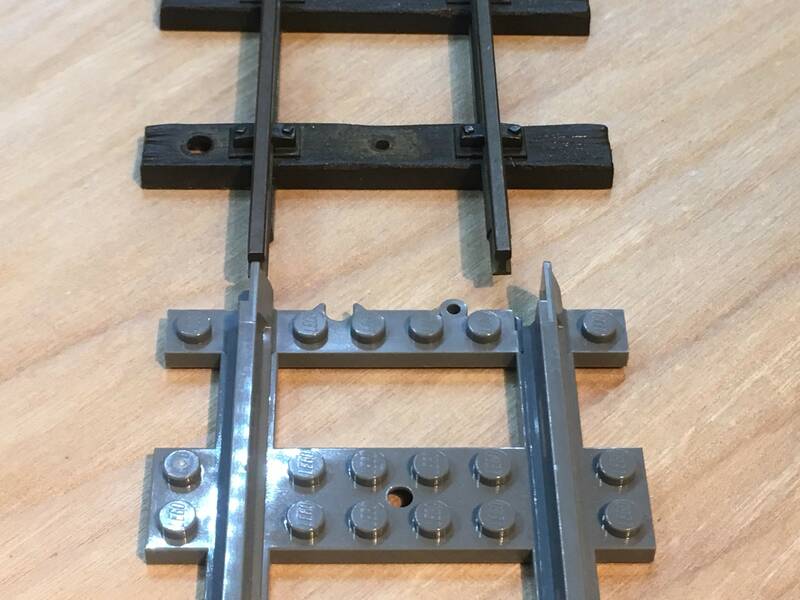 Lego trains have a track gauge of 37.5mm and a back-to-back of 34mm, which is four Lego studs. 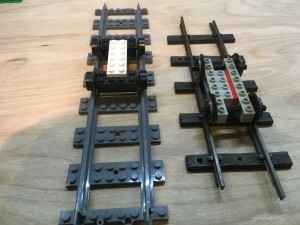 I was considering addressing the problem the other way round – rather than cutting away at the train motor, I wondered if it is possible to build a 100% Lego chassis that still works on the narrower gauge of SM32 track. My inspiration started in December 2017, when my wife bought me the “Lego Winter Holiday Train” for Christmas. I wanted to add a motor, but the correct part was out of stock till February. So I built my own motor chassis using this tiny red motor from the 1990s, so that trains could be run on Christmas Day. The photo here shows my motor bogie from underneath. Is it possible to do something similar with a narrower gauge of track? On the left is Lego track, with unpowered Lego train wheels. On the right is a short length of Peco SM32 track with my prototype. 3 1/2 studs is too wide, and one of the flanges rides the rail. To get a narrower frame, I used a tile (no studs on top) attached on its side to the blue half-pins in one side frame. The parts used to build the frame are show on the right. 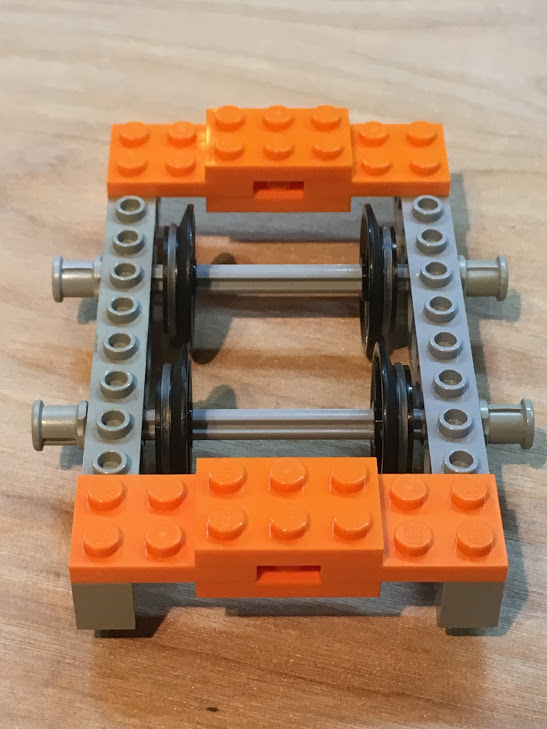 The axles are 5 studs long, and the wheels are train wheels with cross-holes. 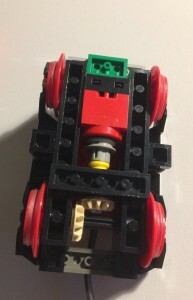 There are several problems with this solution: the two sides of the frame are only held in place by the axles, so the two sides of the frame can move relative to each other (so the axles may bind), and it would be difficult to centre anything on the bogie. (However, see this update). Many narrow-gauge locomotives have the frames on the outside of the wheels. Would this be any easier in Lego? Outside frames are a more elegant solution in Lego. 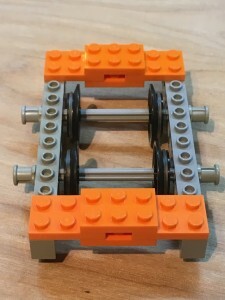 The two sides of a frame seven studs wide can be fixed together using bricks and plates to make a solid construction (using several 2×3 plates, in orange in the photos). I am using 9-stud axles, kept aligned by the bushes outside the frame. The wheels are set in a bit from either side of the frames. The wheels are a tight enough fit on the axle that there shouldn’t be any problem with drifting out of gauge. This outside frame solution has plenty of space between the axles for gears and possibly a motor. The bodywork or bogie pin can be located exactly centrally. The frames can be made rigid with relative ease, which should make for good running. Wheels of different diameters are available, in official Lego sets, in a vibrant aftermarket, and from third parties. Both these solutions could be used to build garden railway trains completely out of Lego parts. Perfect! Well, almost. 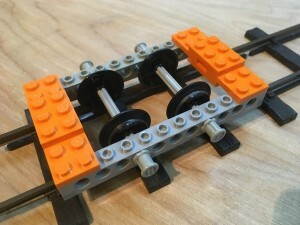 Lego train wheels have enormous flanges, which bump along the plastic chairs on Peco SM32 track. 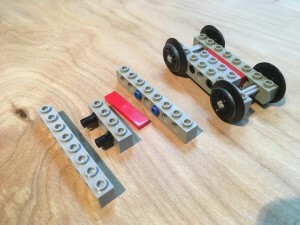 I could 3D-print my own wheels with narrower flanges, but then it wouldn’t be entirely made out of Lego. See an update on inside frames. 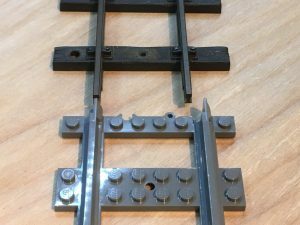 This entry was posted in Garden Railways, Lego, Trains and tagged 16mm, Garden Railway, Gauge, Lego, SM32, Train. Bookmark the permalink.